In the period following the collapse of the Carolingian Empire up to the Fourth Lateran Council (1215), the episcopate everywhere in Europe experienced substantial and important change, brought about by a variety of factors: the pressures of ecclesiastical reform; the devolution and recovery of royal authority; the growth of papal involvement in regional matters and in diocesan administration; the emergence of the "crowd" onto the European stage around 1000 and the proliferation of autonomous municipal governments; the explosion of new devotional and religious energies; the expansion of Christendom's borders; and the proliferation of new monastic orders and new forms of religious life, among other changes. This socio-political, religious, economic, and cultural ferment challenged bishops, often in unaccustomed ways. How did the medieval bishop, unquestionably one of the most powerful figures of the Middle Ages, respond to these and other historical changes? Somewhat surprisingly, this question has seldom been answered from the bishop's perspective. 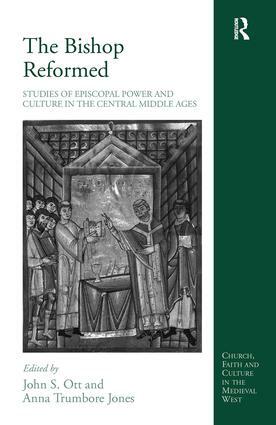 This volume of interdisciplinary studies, drawn from literary scholarship, art history, canon law, and history, seeks to break scholarship of the medieval episcopacy free from the ideological stasis imposed by the study of church reform and episcopal lordship. The editors and contributors propose less a conventional socio-political reading of the episcopate and more of a cultural reading of bishops that is particularly concerned with issues such as episcopal (self-)representation, conceptualization of office and authority, cultural production (images, texts, material objects, space) and ecclesiology/ideology. They contend that ideas about episcopal office and conduct were conditioned by and contingent upon time, place and pastoral constituency. What made a "good" bishop in one time and place may not have sufficed for another time and place and imposing the absolute standards of prescriptive ideologies, medieval and modern, obfuscates rather than clarifies our understanding of the medieval bishop and his world. Contents: Introduction: the bishop reformed, John S. Ott and Anna Trumbore Jones; Lay magnates, religious houses, and the role of the bishop in Aquitaine (877-1050), Anna Trumbore Jones; Bishops and religious law, 900-1050, Greta Austin; Sovereignty and social order: Archbishop Wulfstan and the Institutes of Polity, Renée R. Trilling; The image of the bishop in the Middle Ages, Eric Palazzo; Building the body of the Church; a bishop's blessing in the Benedictional of Engilmar of Parenzo, Evan A. Gatti; Bishop Gerard I of Cambrai-Arras, the 3 orders, and the problem of human weakness, T.M. Riches; 'Both Mary and Martha': Bishop Lietbert of Cambrai and the construction of episcopal sanctity in a border diocese around 1100, John S. Ott; Driving the chariot of the Lord: Siegfried I of Mainz (1060-1084) and episcopal identity in an age of transition, John Eldevik; Pastoral care as military action: the ecclesiology of Archbishop Alfanus I of Salerno (1058-1085), Valerie Ramseyer; What made Ivo mad? Reflections on a medieval bishop's anger, Bruce C. Brasington; The bishops of Piacenza, their cathedral, and the reform of the Church, Dorothy F. Glass; Urban space, sacred topography, and ritual meanings in Florence: the route of the bishop's entry, c1200-1600, Maureen C. Miller; Postscript: the ambiguous bishop, Thomas Head; Index. John S. Ott is Associate Professor of History at Portland State University, USA. Anna Trumbore Jones is Assistant Professor of History at Lake Forest College, USA.